Lock brush size - Welcome to TVPaint Community forums ! Lets say I a brush's default is 16% size, but I'm using it at 80%. I want to be able to switch to fill bucket, then switch back to that brush, and it's still at 80%. How do I do this? Is there a way to lock? It locks in every other program i've ever used (manga studio, photoshop, flash) and it is driving me crazy here. Update your software first. We can't help you with an out dated version. I think the problem simply comes from the fact you don't make the difference between brushes in custom panels and the tool panel. Custom panels are panels where you save parameters of brushes and colour (you can also make complex actions using script). 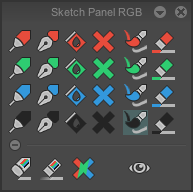 Each time you click on one of this icon, you get the brush and its parameters that have been grabbed. 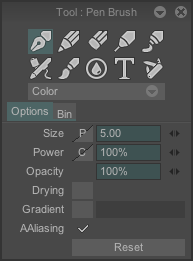 So, when you choose a brush from one of these panels, change a parameter (like opacity), then use any other tool and finally choose back the brush, you will get its default parameters. So, when you use a brush then use the paint bucket, you just have to select the "stroke" on the left to get back to your brush, with the good settings. This was very helpful, but I have a follow up. I just want my "b" shortcut to return to the last brush I was using, at the last parameters. 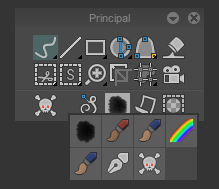 I've been setting my b shortcut to various specific custom brushes, but it'd be great if it just returned to whatever I was using so i didn't have to re-set up the shortcut every time i change brushes. If you switch between paint bucket (or any other tool) and stroke, then you should assign to Shape > Stroke. If you switch between different kind of brushes... I'm afraid you will have to assign a shortcut for each. I think the Shape=>Stroke is Shape=>Freehand in older versions maybe? You should also check the "swap stylus tips" shortcut (if it's in your version), it's a nice one to toggle beetween two tools (ike your painting brush and erasing brush), I use it a lot so it remembers your settings. Basically if you want a switch beetween two tools, one simple way is can to use the same key for two tools, one with the actual key and one with a modifier like maj, it's two shortcuts but still the same key. You can put in in a button of a panel as an "embedded george script" and put a shortcut on it if you want. And you can add more lines for multiple toggles with one button. This is really great, conceptually this makes complete sense to me. But, in actual execution, I 'm not sure I could set this up. I think I might be showing off my technological incompetence here, but are there tutorials to walk me through how to apply these scripts? I wouldn't even know where in TV Paint to click in order to apply these scripts, much less to properly get them to toggle between the tools I wanted. For example, I do have swap stylus tips in my version of TVP, and it would be great to swap between brush and eraser with that, or just swap between two brushes. But, I don't know how to set which two stylus tips I want to swap between. When I click the assigned shortcut, it seems to do nothing. Hey! The script was kind of an advanced part of my post if you were curious about that nothing to worry about, basic shortcuts work great. Just right click on a panel and click "add action", then right click on it and "Edit". Then click on a line and "add embedded george script", you can paste any script on a button that way. Then in your shortcuts you can find all you buttons in your panels and assign them to avoid clicking on it. If you want to make the script work with the tools you want, you just have to find the gith tool name (with the print line I'm talking about in the script) and replace it in the script. You don't have to understand scripting, just replace the tool names. Swap stylus doesn't remember any brush, it just remembers the last settings used with the tip. So you set an eraser on one side, swap the stylus and set a brush on the other side. Then each time you swap you have one tool or the other, and if you change the tool or parameters on a tip it will stay this tool. Can you assign a specific size to an erase function? I've been reading through past posts regarding stylus settings for the eraser function, and I'm still confused as how best to set this up for my use. I have right click set to my lower stylus button and would like to keep that. I would like to set up the upper stylus button as the erase button. My question: How do I assign a particular size of eraser to that upper button? Or can you only assign a general "erase" function that you then have to set the size to each time you use it?